Utrecht (Dutch pronunciation: [ˈytrɛxt] ( listen)) is the smawest province o the Netherlands in terms o aurie, an is locatit in the centre o the kintra. It is bordered bi the Eemmeer in the north, Gelderland in the east, the river Rhine in the sooth, Sooth Holland in the wast, an North Holland in the northwast. Utrecht maks up ane region o the International Organization for Standardization warld region code seestem, haein the code ISO 3166-2:NL-UT. 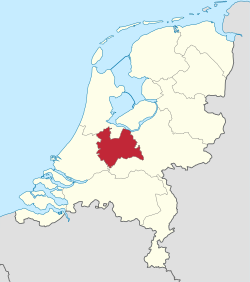 Important ceeties in the province are its caipital (cried anaw Utrecht), Amersfoort, Veenendaal, Houten, Nieuwegein an Zeist. The Province o Utrecht consists o 26 municipalities. Wikimedia Commons haes media relatit tae Utrecht (province).